Chicago bed and breakfast travel guide for romantic, historic and adventure b&b's. 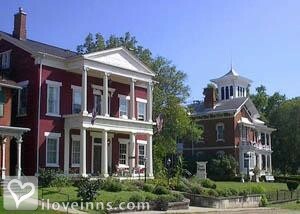 Browse through the iLoveInns.com database of Chicago, Illinois bed and breakfasts and country inns to find detailed listings that include room rates, special deals and area activities. You can click on the 'check rates and availability' button to contact the innkeeper. Chicago is filled with lots of summertime festivals, free music, a magnificent lake with open park for all, live theatre, dancing in the park and some of the best restaurants ever. Chicago, Illinois is known as the Windy City, but more affectionately it is called the Friendly City. No one does friendly better than the staff of a Chicago Bed and breakfast inn. There are many popular Chicago attractions and innkeepers are in the know for the best of everything. Even the budget-minded tourist can enjoy Chicago. Admission is free to the Shedd Aquarium and Lincoln Park Zoo and most all the Chicago museums offer free entrance on certain days of the week. Ice skate in Millennium Park, splash in Crown Fountain and gaze at the Cloud Gate Sculpture. Take a Lakeshore Cruise or a Chicago River boat ride and visit Navy Pier, the top Midwest tourist destination with a boardwalk, 150-foot ferris wheel and Segway tours. Undoubtedly a sky view of Chicago is best seen from Willis Tower and Hancock Observatory. Sports, shopping and dining on every ethnic food imaginable�Chicago has it all. By City Scene Bed & Breakfast.